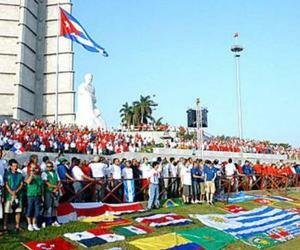 Over 1200 foreign visitors, many of them US citizens, will participate at May Day celebrations in Cuba, which include a march on Havana´s Jose Marti Revolution Square. The general secretary of the Cuban Workers Confederation, Ulises Guilarte, told PL news agency that a large number of those visitors come from the United States, which has become common place over the past few years in these celebrations for International Workers´ Day. The activists from around the world come on the invitation of different solidarity organizations, unions, and on their own initiative to join the Cuban people in what is known as the largest mobilization of persons on the island in support of the Socialist Revolution, Guilarte said. On May 2nd, after the march, Havana´s Conventions Hall will host an international Solidarity Forum, and later, foreign and Cuban specialists will gather for a debate on the impact by neoliberal policies on the working class. But previous to May 1st, many visitors will join voluntary work actions and will tour work centers; they will also meet with the people to have a first-hand look at Cuban society and the economic and social project under update and development. On May Day, Cuban workers will demand the lifting of the US economic, financial and commercial blockade of Cuba and the return to the Cuban people of the territory occupied by the US military base in eastern Guantanamo province. The workers will also expressed their support to all progressive and revolutionary processes in this part of the world in the face of the counter-offensive launched by international and local right wing circles to thwart the right of the peoples to build their own future, said the union leader.